By the time Coss Marte, Founder and CEO of ConBody, landed in solitary confinement at Rikers Island Prison, he was ready for a new path. And that path would eventually lead him to create a fitness sensation with a built-in cause component that landed him in The New York Times, Buzz Feed, Elle, Vice, and The Startup podcast. While sitting alone in his cell 23 hours a day, he reflected on his ninth incarceration. This time, he had gotten his own health in check, losing 70 pounds through prison cell calisthenics. After helping himself, he helped other inmates get healthy too; 20 of them lost 1,000 pounds combined. And it’s hard to understand what solitary confinement does to a person unless you’ve researched it extensively or lived it, but it is certainly not something one would ever hope for. During this interview, I referenced solitary confinement as “an opportunity” for Marte as he noted that it was within the tiny cell, in the dead of summer, that he found his inspiration for ConBody. That’s a cringeworthy moment for me now, but I didn’t want to edit it out. It’s an important moment to illustrate why it’s hard for the formerly incarcerated to readjust or find work: it’s difficult for the outside world to understand what they’ve been through. And outside from difficulty understanding, landing a job is nearly impossible for someone with a felony on his record. According to the National Institute of Justice, within five years of release, about three-quarters (76.6 percent) of released prisoners were rearrested. So, when Marte set out to build ConBody, he also set out to create jobs for the formerly incarcerated. As he built the business, he built a pipeline of people who were currently in the prison system, starting right back at Rikers Island. But how do you make the prison where you were once an inmate embrace you as a peer? For Marte, it took a big goal and a little luck. After leaving prison, Marte set goals with a program called Defy Ventures, which supports the incarcerated and formerly incarcerated to become successful, legal entrepreneurs and employees. They empowered him to reach for achievements he thought were impossible. You’ll hear about some of those on this week’s episode of #WeGotGoals, but one opportunity that came out of Defy Ventures seemed plucked right out of the universe for Marte: he was asked to speak at a conference for prison wardens and police officers in New Orleans. Marte is a natural marketer and when his session at the conference was empty, he corralled wardens from other sessions, filling his room and sharing his story with them. “It was the first time they really listened to someone who was incarcerated,” Marte said, remembering how the business card for the Deputy Commissioner of Rikers Island landed in his hand. Today, Marte is building bridges not only into the prison system, but also between the formerly incarcerated and the young working professional who come into his gym. “The audience that really comes to our classes is really people who have never met people who have been incarcerated,” he said. Marte noted that using the word “Con” in the name caused a little strife with advocates for the formerly incarcerated, but that branding helped him gain some confidence in his mission. In the beginning of this business venture, when his fitness company was still called Coss Athletics, he would share his story at the beginning of every class. “I’ve had people walk away from the class because of that,” he said. Owning the word “con” and building a business around it? “For me, it just felt like freedom,” Marte said. Catch Marte on this week’s episode of #WeGotGoals and listen for his really big goal to raise $2.5 million to extend his reach. 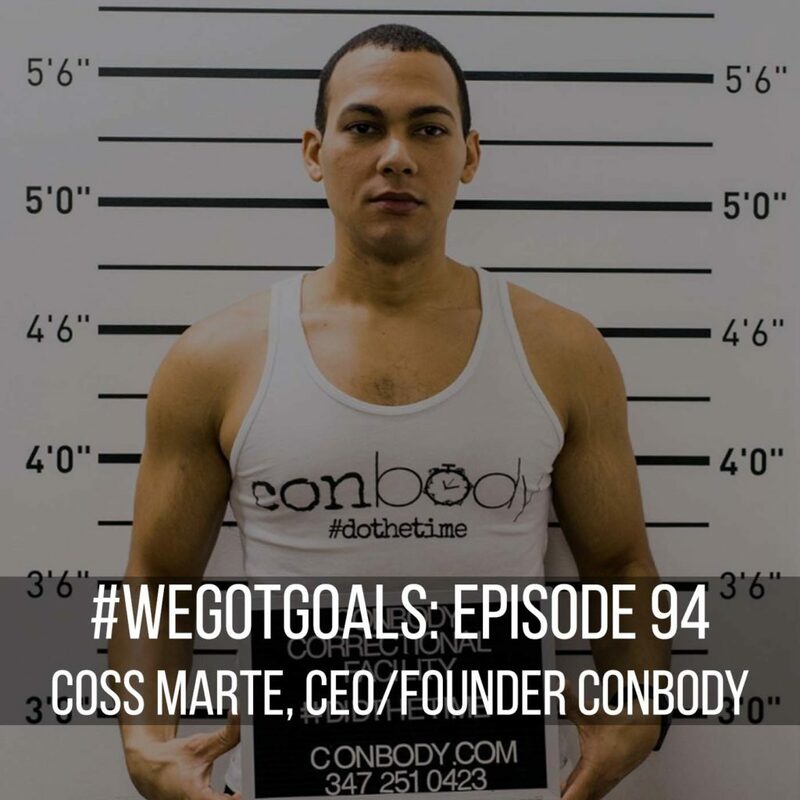 Like hearing what goal getters like Coss Marte have to say? This season, you’ll hear guests who have done big things related to building community, making the world a better place, getting better, stronger, and faster, and giving generously. You can subscribe to the #WeGotGoals podcast wherever you like to listen to your pods, on Apple, Spotify, and more.